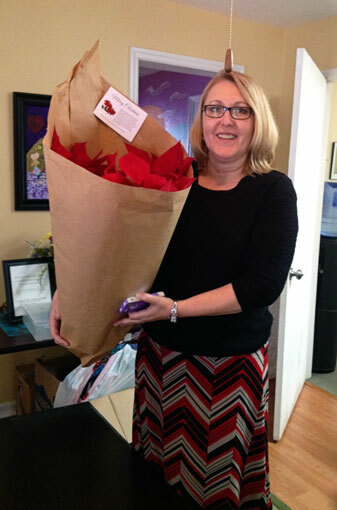 For the last few weeks, we have been taking orders and delivering the beautiful flowers all over the CSRA. It has been wonderful that some friends which I don’t often get to see have placed orders, and we have gotten to catch up. 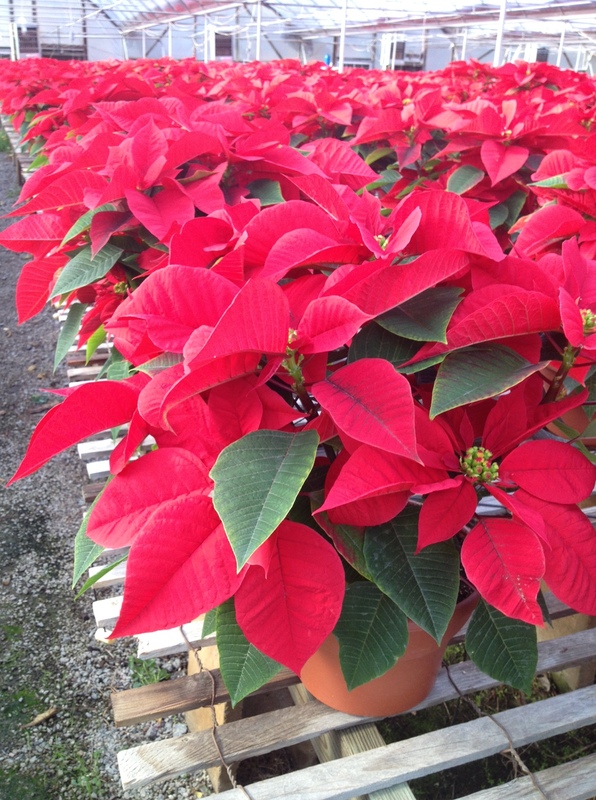 If you purchased poinsettias, thank you so much for your support. I have a friend, who I will call Dee, that I have known for many years. 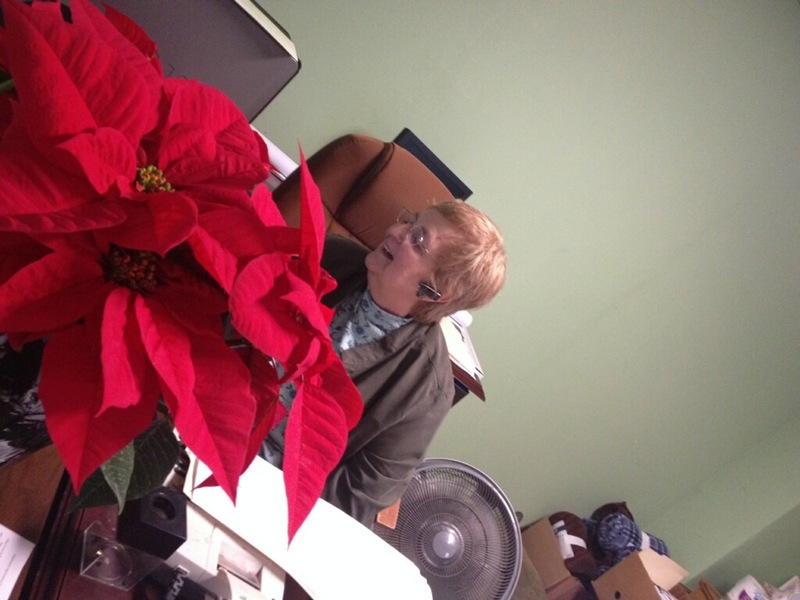 She placed an order for ten poinsettias. While that was a large order, what really made it unique is that Dee lives out of state…and I don’t mean just across the river in South Carolina. Dee’s order included instructions that the poinsettias be delivered to, “to any homeless shelter, soup kitchen, women’s battered home, and the like in/around the area.” Wow. Just wow. Not only was she helping out Mark, but she got a two-fer–blessing the staff and clients of some very wonderful service agencies in our area. Challenge accepted. I made a little card that I attached to each poinsettia explaining the story. I called my friend Annette who is the person most knowledgeable about Augusta homeless and women’s shelters that I know. She has been Chairman of the Board at Mercy Ministries, and still gives a great deal of her time and resources to this important ministry. (More on them, later) Annette and I got to play Santa Claus, delivering beautiful poinsettias from Sanderlin’s Greenhouses to several facilities. 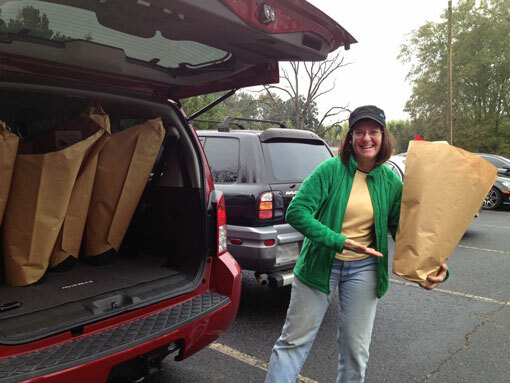 Here is Annette doing the spokesmodel thing as we prepared for a delivery. Hope House is a residential treatment facility for women dealing with substance abuse and co-occurring mental health disorders. They serve homeless single women, pregnant women, and women with children; many who are seeking to regain custody of their children. Women live in an independent apartment, some with their children, and share a common kitchen and dining area. The facility seeks to help women learn how to parent and live productive lives free of drugs and alcohol. The ladies on staff we visited with were thrilled to receive the poinsettias on behalf of the facility. 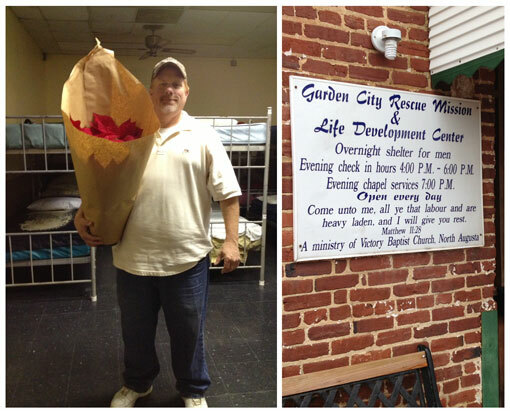 Garden City Rescue Mission provides a place for homeless individuals to find shelter, food and spiritual support. 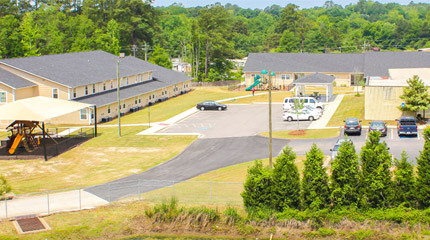 Originally only available to men, the Augusta mission now can accommodate some women and children in a separate facility. When we visited, they were putting up Christmas decorations. As you can see, the gentleman who greeted us, was quite pleased to receive the poinsettia. Eagle’s Perch provides a safe, temporary place for women on waiting lists for in-house drug and alcohol treatment programs to reside. Apparently there are more women in need of treatment programs than there are treatment programs. Continuing to live in their previous surroundings can sometimes make it difficult to stay clean and sober, so this facility provides a supportive environment while they wait. Clients at Eagle’s Perch are introduced to a 12 step program (AA/NA) provided with food, clothing, a bed and other personal needs. The women are encouraged to attend meetings, get sponsors and be a part of a clean, recovery oriented household. I didn’t take a picture of this facility, as director Susie Rabon was not there at the time, and I did not want to intrude upon the resident’s privacy. They loved their poinsettias, however. SafeHomes of Augusta exists to serve victims of domestic abuse. They provide a 24-hr crisis line; safe and confidential temporary shelter for victims of family violence and their children; family abuse intervention for women, men, teens, and children; guidance to networking with community agencies; and support in ending the cycle of violence. We visited their offices, as their residential homes are kept secret for the safety of the residents. The staff was so pleased with their poinsettia, and asked to take our picture, particularly after I told her about my friend’s donation. Next, I got to take a picture of her. 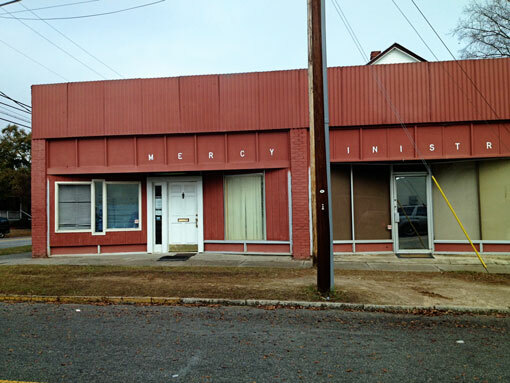 Our last stop was a Mercy Ministries, which provides an important service to Augusta homeless. I had no idea that when morning comes at the local homeless shelters, everyone is ordered out, but usually has no place to go. Many come to the Mercy Ministries day shelter, the only place for the homeless to come in out of the elements, bathe, wash clothes and eat a warm meal. The shelter also provides phones, computer kiosks, help paying for medications and help obtaining identification cards. They give out bags of groceries regularly and serve as a liaison to help homeless obtain work and get assistance from various agencies. The ministry also provides after school snacks, activities and homework assistance to children in a local housing community. Director Fran Oliver, along with her now-deceased husband Jerry, founded the ministry in 2001. In 2006, they moved to their current location in an old glass company. We left a lovely poinsettia to brighten up the main room with many of the clients. Here is Fran with another poinsettia. She is an amazing lady who has such a heart for the homeless. Annette used to be a professional photographer for the local newspaper and took this shot. I think this must be one of those journalistic, artsy shots. What a day! Visiting these agencies and ministries made me sooooo very thankful for my home, my health, food on my table and my many other blessings. Thank you, Dee, for your generous gift. Thanks also for my tour guide, Annette. And, thanks to you for reading this blog, for buying poinsettias, and for your friendship and your prayers. Wow. Just wow. Great blog. Thanks to ebryone who’s blessed our family!